The Samsung CHG90 isn’t the sharpest screen in its class, but the monitor’s combination of size, screen real estate, image quality, 140Hz speed and software tricks will make you go ‘WOW’. 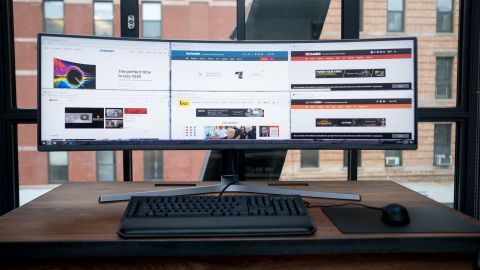 The popularity of ultra-wide monitors has risen to a fever pitch, and now Samsung has released the one super-duper, ultra-wide monitor to rule them all. The Samsung is CHG90 is a massive, 49-inch gaming monitor with an unheard of 32:9 aspect ratio that will envelop you in its curved display. This is not only the widest monitor we’ve ever tested – it’s also the most versatile. With the ability to either display massive game worlds as a 21:9 screen with some extra screen real-estate leftover, or act as two distinct 16:9 displays, the Samsung CHG90 is the most impressively flexible gaming monitor we’ve ever tested. Our only hang ups with this 49-inch curved gaming monitor are the massive amount of desk space you’ll need for it and its $1,499 (£1,294, AU$2,499) asking price. That is a heady price even for a 4K TV. With the same amount of money, you could buy yourself three or even more monitors. However, the Samsung CHG90 has an arguably better panel than anything you’ve ever owned before. It’s one of the biggest computer monitors on the market and, with its 3,840 x 1,080 resolution splitting perfectly into two Full HD 16:9 displays, you could think of the CHG90 as getting two monitors for the price of one – but more on that later. At the same time, the HDR colors and 144Hz refresh rate of the CHG90 make it one of the best-looking gaming monitors on the market. Samsung’s 49-inch monster runs into stiff competition against the 35-inch Acer Predator Z35, which comes at a lower $1,099 (£999, AU$1,799) price and offers a higher resolution of 3,440 x 1,440 pixels. Likewise, the 34-inch Asus ROG PG348Q is a smidge more affordable at $1,299 (£1,099, AU$1,599) while being just as sharp as Acer’s offering. Up against its rivals, Samsung still wins a few fights with its QLED technology and 144Hz refresh rate, whereas both the Predator Z35 and ROG PG348Q only utilize IPS panels that max out at 100Hz. The Samsung CHG90 is hard to miss. The monitor’s massive, 47.36-inch wing span lends it an intimidating presence. When you’re sitting at the center of the whole thing, it almost feels like the screen is about to wrap itself around you. The monitor’s 32:9 aspect ratio is equally as cartoonish and overwhelming. There’s simply no way to see the entire monitor at a glance, because your field-of-vision just isn’t wide enough. Your desk is unlikely to be able to handle the extremely wide nature of this display either. If anything, the sides of this monitor are likely going to hover above and past the ends of your desk. Also, be sure your table big enough to accommodate the screen’s rather large stand. Counter to its overwhelming size, Samsung went with a really understated design for the CHG90. In fact, the 49-inch monitor’s simple and functional design helps it blend in with any office environment. The styling might be bland to some, but it stands out from the Predator Z35 and ROG PG348Q’s use of edgy pedestals, red accents and hologram projectors. The only slight bit of embellishment you’ll find on this monitor is a ring light built into the back of the monitor. Samsung has even classed up this area by incorporating a ring of swirling plastic molding that also does a great job of hiding the VESA mount. No matter how insane you might think a monitor of this size and breadth is, you’ll be grinning like an idiot as you take in the absurdity of this 49-inch monitor. There’s just something magical about sitting in front of all of the Samsung CHG90’s spectacular pixels. Thanks to Samsung QLED, colors are richly represented without being blown out, and blacks are as dark as the night sky. The panel’s quick 144Hz refresh rate is an extra cherry that makes this high-resolution screen even perfect for gaming as well as just watching your windows move around with perfect smoothness. Battlefield One and Mass Effect Andromeda were sights to behold when we had the games running at full resolution and Ultra quality settings. That said, we had the luxury of running these games on a decked-out, Samsung-provided test rig equipped with a Ryzen 7 processor and AMD Radeon RX Vega 64. You’ll need a tricked-out gaming machine to take full advantage of the Samsung CHG90. It’s impossible not to appreciate the massive amount of screen real estate the Samsung CHG90 affords you. In our testing, we easily had a dozen applications open at the same time – and still had room to fit in even more windows. This monitor will make a multi-tasking master out of you. Through a desktop application called the Easy Setting Box, we were able to split the monitor into six distinct areas. There’s a variety of other modes, including one that splits the screen area into three vertical panes or even two extremely wide horizontal splits. Users can dive in and customize exactly how each portion of the display is split. However, unlike the Windows Snap feature built into Microsoft and Apple’s respective operating systems, splitting up our open applications in this way leaves gaps of wasted pixels that we really wish were smaller. There are even more screen splitting options you can choose from through the On-Screen Display (OSD) menu. For example, if you wanted to run two separate computers at the same time, you could have the monitor pull both video sources and split itself into two perfect 16:9, 1,920 x 1,080 resolution displays. Alternatively, you could have the screen act as a 21:9 display for games and movies, while reserving the rest of the monitor for work or email. Of course, you could use the monitor in its entirety for size to create Guinness world record-breaking Excel spreadsheets, like the one pictured above. The amount of flexibility the Samsung CHG90 has is astonishing, and we feel like we’ve only scratched the surface in our time reviewing it. These screen-splitting features really set this display apart from any other ultra-wide monitor on the market. The Samsung CHG90 is one of the most functionally distinct and visually impressive monitors we’ve ever tested. It’s not the sharpest screen in its class, but the monitor’s combination of size, screen real estate, image quality, color reproduction, 140Hz speed and software tricks will wow you so much you won’t care. It’s high $1,499 (£1,294, AU$2,499) asking price is going to give a lot of users pause. But, after using it, we’d happily take on the expense, because we don’t want to go back to another old display.